Need a secure place to get stuff sent? We've Moved....to Redmond Town Center! 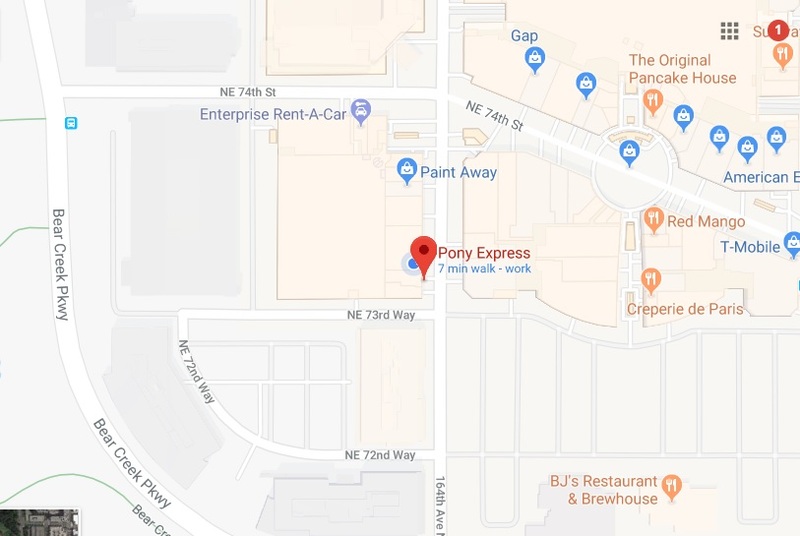 Here at Pony Express Redmond, we strive to be your one-stop-shop for all your business and shipping needs. Maybe you finally have a day off or you're attempting to get some errands done during your lunch break. We can help with that. Need to ship something? No problem. Renew passport photos? Easy. Get something notarized or open a mailbox? Done and done. You'll be greeted with a smile and excellent customer service to help you get on with your day. Maybe you'll even have some time left over to tackle the laundry. Isn't it about time that you send that thing you've been meaning to send? It's not always fun to do, but we promise we'll try to make your experience as pleasant as possible. You'll have your choice of regular USPS* mail, DHL, UPS, or FedEx for all your international and domestic shipping needs. Private mailboxes are great for people who run their businesses from home. It offers privacy and security, and we can even act as your remote reception desk by signing for packages and letting you know when something important arrives. Full time notary. $10/Stamp for the first two, $5/Stamp thereafter. All business hours. No appointment needed. So did you groan at the prospect of having to renew your passport, dreading to have yet another less-than-flattering photo of your ten-year-older self? For just $12.98 for a US passport photo, you'll get a pair of possibly the best passport photo of yourself you've ever seen. Many people look like younger, even more attractive versions of themselves. You may even be tempted to use it as your new profile picture. Need a Chinese Visa photo, another custom photo, or even an infamous *gulp* Canadian Passport or other photo for Canada? For $24.98, you can set your mind at ease that you will receive photos that are guaranteed to be accepted or your money back!